A Glossy Ibis was seen in the Wareham area on Sunday and was seen to go down behind Swineham gravel pits at dusk. Although I have seen this species before in Dorset and have it on my year list from the one seen in Devon, the chance see watch one in Poole Harbour couldn’t be turned down. Glossy Ibis has had a huge status in status in the last three or four years, from rare vagrant to scarce autumn and winter visitor. This has gone hand in hand with a population explosion in southern Spain and if we are lucky we may see breeding in the UK some time in the next decade. I searched the area around the gravel pits, along the banks of the Piddle and out to Swineham Point. 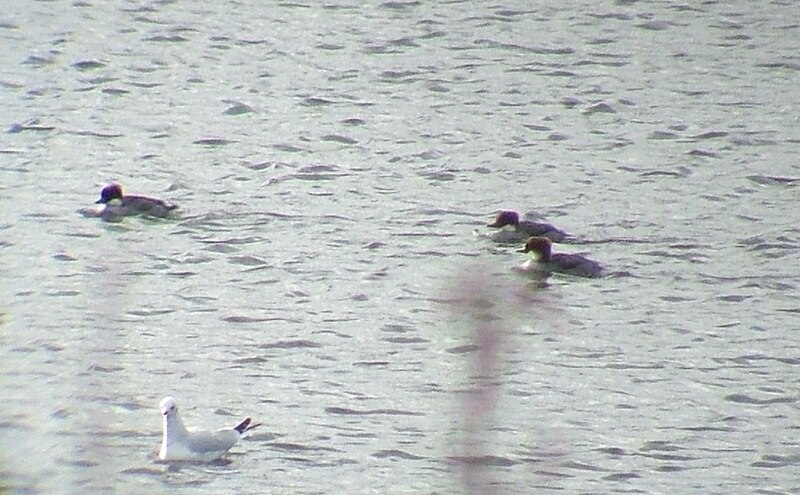 Although I failed to find the Ibis, my time wasn’t wasted as I saw five Marsh Harriers, five Spoonbills, 32 Avocets and on the pits three ‘redhead’ (female or immature) Smew. The latter were particularly engaging as they were perched upright on the ice exposing their normally hidden white bellies. I also heard a most peculiar twanging sound caused by Canada Geese bending, but not cracking the ice as they tried to take off. Swineham gravel pits are one of the few areas of fresh water around Poole Harbour. The peculiarly named River Piddle enters Poole Harbour at Swineham. To the right of the river is the saltmarsh of Swineham Point, to the left is Keysworth where Stour Ringing Group ran a very succesful ringing program in the late eighties and nineties until the estate changed ownership. The Marsh Harriers were all to far away for photos, so here's one I took earlier - in Ethiopia! Unlike Hen Harriers which are suffering badly from misguided persecution, the fortunes of Marsh Harriers are on the up. Just inside the River Piddle sea wall is Suppressor's Pond, named after an unfortunate incident several decades ago. I spent the late afternoon at Lytchett Bay just in case the Ibis had made it that far and in the hope a Woodcock might fly over at dusk but the best I could manage was 14 Avocets and six Fieldfares.